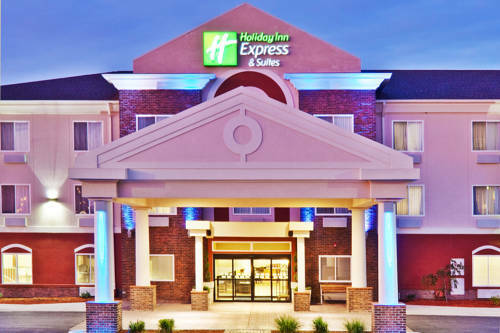 Welcome to the Holiday Inn Express Hotel & Suites in Miami, Oklahoma Conveniently located off I-44, our Miami, Oklahoma hotel is less than two miles from downtown Miami, giving guests easy access to local attractions and businesses. Your family will enjoy a stay at our Miami, OK hotel because of its convenient location near area attractions like Twin Bridges State Park, the historic Coleman Theatre, the Motorcycle Museum, Mickey Mantle's childhood home and the Dobson Museum, where you can learn about local Native American tribes. Downtown Miami, which boasts the longest original strip of historic Route 66, features premium shopping and a variety of local restaurants. It is located just two miles from our hotel in Miami, Oklahoma. Our hotel is situated close to several local companies such as Discovery Plastics, J & M Farms, Wal-Mart, Eagle-Picher Industries and Newell Coach. The Peoria Ridge Golf Course, home of the annual NGA Golf Tournament, is just four miles from our hotel in Miami, Oklahoma. In addition, we offer deluxe amenities to accommodate business travelers, with a 24-hour Business Center and meeting rooms. During your Miami visit, enjoy our excellent hotel amenities including free high-speed Internet access, a heated, indoor pool with a Jacuzzi, a Fitness Center and free hot breakfast bar. Start planning your trip today and take advantage of our great Miami, Oklahoma hotel deals and rates. Miami has the longest Main St. on all of Route 66 and just outside of town is the last and longest section of the original "Ribbon Road" that is listed as an Oklahoma National Historic Landmark. Catching the eye of visitors since 1929. its a vaudeville theatre and movie palace, that hosting acts including Will Rogers, Bob Hope and Bing Crosby. Is has been restored to its original style including the return of the "Mighty Wurlitzer" pipe organ. Mickey's childhood home where he first learned to play baseball with his father and grandfather. The largest municipal swimming pool in the state of Oklahoma has six wading pools, a 45 foot speed slide, a 35 foot circular slide and water games for the entire family. In business since 1954, this chapel is a landmark in Northeastern Oklahoma. Its 46,500 surface acres of water are ideal for boating, skiing, fishing, swimming and sailing. In fact, the lake, which lies in a southwest to northeast direction, is popular with sailboat enthusiasts wishing to take advantage of the prevailing wind. Try your luck at more than 500 slot machines and electronic games. Great food and offer high stake slots, off track betting and blackjack. Coffeyville remembers the day that the Dalton Gang rode into town to rob two banks, and got shot full of holes by an irate citizenry.